BDV-226220-BDV is the number that I am asked to add into this post. 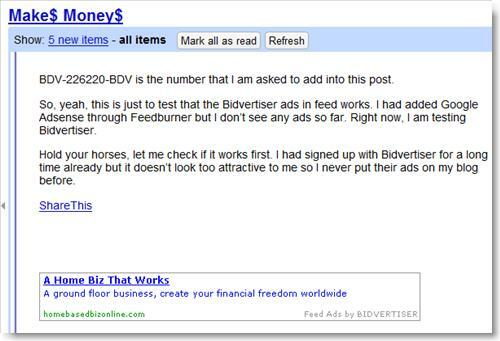 So, yeah, this is just to test that the Bidvertiser ads in feed works. I had added Google Adsense through Feedburner but I don’t see any ads so far. Right now, I am testing Bidvertiser. Hold your horses, let me check if it works first. I had signed up with Bidvertiser for a long time already but it doesn’t look too attractive to me so I never put their ads on my blog before. **Hmmm…weird….does this mean that I now have two feed addresses? Will this make my pwetty feedburner number goes down? If that is the case, it ain’t no fun, eh? This is how the ads from Bidvertiser looks in the feed. Still, I would have prefer Google Adsense through feedburner. I activated my adsense through feedburner too and apparently they aren’t serving ads through feeds yet, only on the website. Bummer, really!